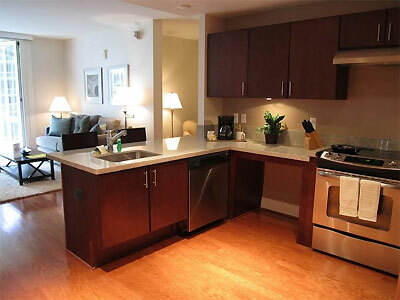 Suite Solutions provides all inclusive, fully furnished apartments throughout the DC Metro Area and in most major markets across the U.S.
An alternative to living out of a suitcase, Suite Solutions offers turnkey ready apartments complete with separate bedroom, living and dining space. Our guests enjoy all community amenities such as 24 hour concierge, swimming pool, fitness center, business center and much more! All inclusive truly means ALL inclusive...contemporary furnishings, house wares, linens, d�cor, all utilities including WiFi and cable TV. We also include in suite washer/dryer and parking! All inclusive and all on one convenient bill! With stays anywhere from one week to one year or longer, Suite Solutions provides their guests with the flexibility and convenience they need. You will get a quality apartment with a "home away from home" atmosphere at a cost far less than a typical hotel room. We have many locations from which to choose and our experienced staff can assist you in selecting the right location to meet your specific needs! Please call us today for more information and to book your reservations! We look forward to serving you and your guests!